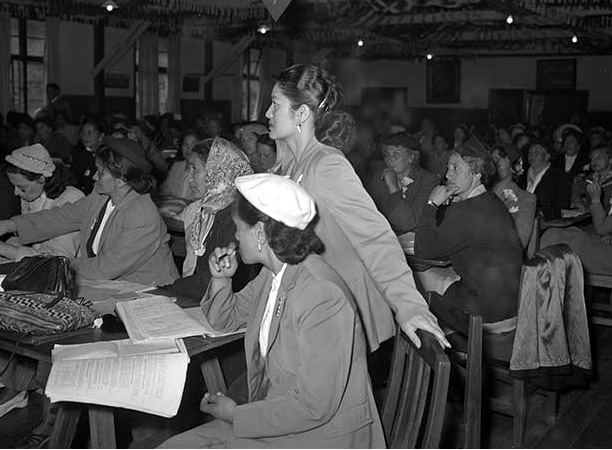 25 September 1951 was the first day of the inaugural conference of the Māori Women’s Welfare League. Eighty-seven delegates – representing 187 branches and a membership of 2503 women – gathered at Ngāti Poneke Young Māori Club in Wellington. These groups had grown out of the efforts of the Department of Māori Affairs in the late 1940s. Officials, particularly Controller of Māori Welfare Te Rangiātaahua Royal, had worked to set up small, local working groups to promote Māori welfare and well-being. appointed representatives to affiliate with the National Council of Women and the Pan Pacific and South East Asia Women’s Association. The League has worked with Māori people and the government ever since. Through the 1950s and 1960s, health issues such as immunisation, family planning, obesity and tuberculosis were prominent, as was domestic violence from the 1970s. In the 1980s, the League set up the Healthy Lifestyles programme and released a report, ‘Rapuora: health and Māori women’. In 1993 the League, with the National Maori Congress and the New Zealand Māori Council, set up Te Waka Hauora, a national Māori health authority. The league became involved in the provision of health and well-being services for families at a regional level in the 1990s and 2000s. We have 10 biographies, 3 articles, related to Māori Women's Welfare League established .